Science Fiction became a distinct genre in 1926 with the advent of Amazing Stories, published by Hugo Gernsback, but it did not become a distinctive form until John W. Campbell Jr. took over as editor of Astounding Science Fiction in 1938 and began shaping it into something to be reckoned with. It was Campbell who began publishing both Isaac Asimov and Robert A. Heinlein, and discovered and nurtured many if not most of the writers who came to exemplify SF's Golden Age. After Campbell we have what we now recognize as modern science fiction. 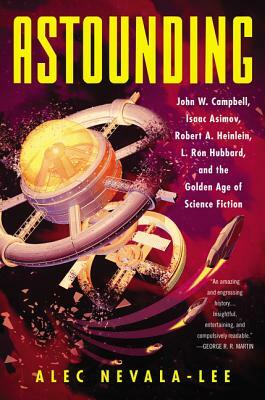 This biography tells Campbell's story, throwing light on the process and the personalities (including L. Rob Hubbard, who along with Heinlein and Asimov formed the Big Three who dominated the field for most of the 1940s), and giving us a history of origins and evolutions, showing us from whence the marvels of the form developed. Anyone interested in the history of the field will find this invaluable. Alec Nevala-Lee was born in Castro Valley, California, and graduated from Harvard University with a bachelor’s degree in classics. He is the author of three novels, including The Icon Thief, and his stories have been published in Analog Science Fiction and Fact, Lightspeed, and The Year’s Best Science Fiction. His nonfiction has appeared in the Los Angeles Times, the Daily Beast, Salon, Longreads, the Rumpus, and the San Francisco Bay Guardian. He lives with his wife and daughter in Oak Park, Illinois.